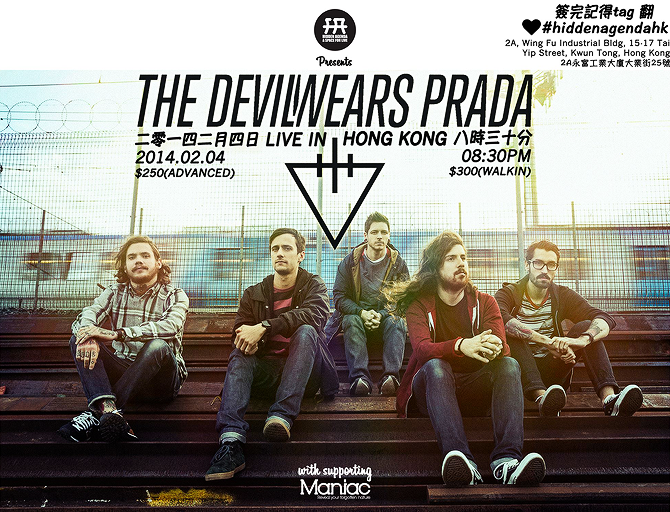 Concert Review: THE DEVIL WEARS PRADA, 02/04/2014 in Hong Kong - GENRE IS DEAD! Here comes another concert year. By the time I’m typing this blog post, I’ve been to 2 shows already – first one was James Blunt, second one was The Devil Wears Prada. I have another 2 shows to go and I’m very excited to see Suicide Silence and Bullet For My Valentine in the next few months. This year is gonna be a year of heavy metal music (besides James Blunt) for me. So, here’s my first concert review on GID – The Devil Wears Prada Live in Hong Kong 2014. The Devil Wears Prada (TDWP in short) is an American metal band from Ohio formed in 2005. The current lineup of the band is Mike Hranica (vocals), Chris Rubey (lead guitar), Jeremy DePoyster (rhythm guitar, vocals), Andy Trick (bass) and Daniel Williams (drums). 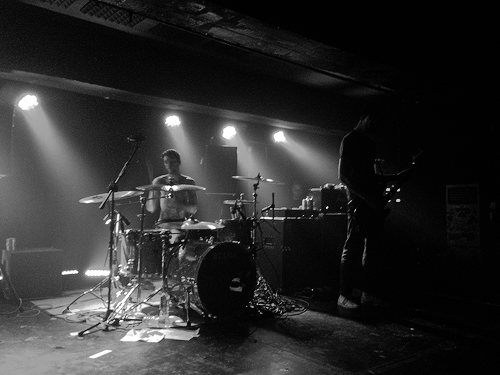 The band’s latest album “8:18” was released in 2013 and they began touring with the new album in late 2013. In 2014, TDWP continued to tour around the world, touring places in Australia and New Zealand then touring some places they haven’t visited before in Southeast Asia, including the place where I live – Hong Kong. I’m not a big fan of TDWP and I only have brief knowledge to their music (the band’s music is awesome btw). Since TDWP show was announced right before the Chinese New Year, I thought: I should go to see a metal show as the last metal show I’ve been to was Architects (UK)’s show in 2012 which was a long time ago. I wanted to feel the vibe from metal shows again so I decided to see them live and it’s a great way to celebrate the Chinese New Year as well. I went to Hidden Agenda (the concert venue) with my friend Alyssa. We arrived there so early that we’ve waited for like an hour outside the door. We chatted while we’re waiting, talking about some shows we wanted to see but weren’t able to go to, kinda like a joke but sad and true, lol. We entered the venue at about 8.30pm, and we waited again for the supporting band Maniac (a local metal band) to perform. Maniac was on stage at 9.30pm and they played for about 30mins. To be honest, I’m not familiar with the local underground music (as we usually call the rock scene in HK) and I thought Maniac wasn’t my type, but they were a great warm up, so overall they’re good. My previous experiences of seeing shows at Hidden Agenda were that I usually stood in the front row, and the best part of that venue is there’s no barricade between audience and stage, it’s somehow both an advantage and disadvantage but I like this kind of setup because it creates a great vibe for an intimate show. The show overall was really great especially Mike, who is very energetic for a frontman. I would describe him as a beast. Mike did the screaming vocals and Jeremy did the clean vocals, the pair did an awesome job and I love the chemistry between the 2 men. The band played a big portion of songs off their new album 8:18, such as “Gloom”, “First Sight”, “War”, “Sailor’s Prayer”, “Martyrs”, I gotta say those songs were absolutely killer when performing live, great songs for headbanging, moshing and crowd-surfing. During the show, there was lots of crowd-surfing, I’m not sure if there’s moshing as well because I was standing in the front so I couldn’t see if that happened, me and my friends did lots of headbanging too! It’s so good to have this good feeling at a metal show again and there’s no doubt that TDWP did a great show even when there were only about 300 people in the venue. I got to meet Chris, Jeremy and Daniel after the show and they’re so nice. I got Daniel’s signature drumstick after the show which was a bonus! All in all, that night was really great and awesome and it’s the best way to start off the Chinese New Year. What’s left after the show? Neck pain and knee pain as expected haa! Plus, I’m so stoked for the next concert, seeing Suicide Silence on March 9 (the day after my birthday), I’m sure it’s gonna be twice time heavier than the TDWP show, can’t wait!